Their findings led them to develop the concept of connected reading—a model that recognizes that today’s readers live within a reading community, both online and in person, and use a variety of forms of text. The authors also explore ways to help students become connected, active readers, not just passive recipients of whatever scrolls past. “We need to teach students strategies for dealing with digital texts,” says Hicks. But, he stresses, the authors are not trying to create a dichotomy between print and digital. “What we’re suggesting is that we do both,” he says. Collier, Lorna. 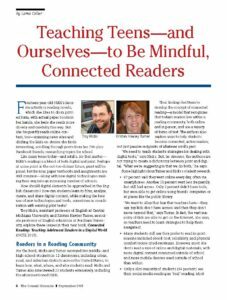 “Teaching Teens—and Ourselves—to Be Mindful, Connected Readers.” The Council Chronicle 25:1 (2015) 6-8. Copyright ©2015 by the National Council of Teachers of English. Reprinted with permission.